We were very pleased to have engaged Livinz Synthesis company to help us with the design of our home. 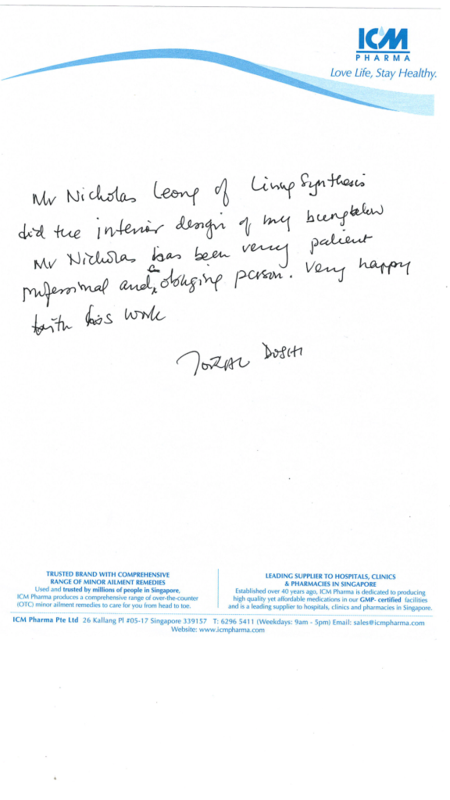 Designer was very understanding and patience towards our requirements. He is always there to offer us with valuable tips and share his knowledges on building our first home. He is very experienced in his job and customer-oriented which enable him to execute his plans well with his partners. We are very satisfied with our newly renovated house that turns out to what we really want – Cosy and comfortable home. 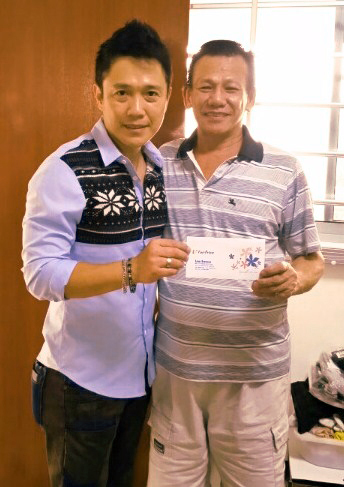 During this journey with Livinz Synthesis team, we have also forged a great friendship with them because of his friendly and positive attitude. We strongly recommend everyone to engage Livinz Synthesis company for your new house because of the great workmanship, affordable price and able to deliver what was promised. To kick start, quotation does not include the house theme you were asking for (The ID mentioned whichever ID ﬁrm we engage, it’s the same) and they had the cheek to ask for ﬁrst payment when they didn’t even send us the 3D drawings. No protection were done to my existing parquet and I raised this issue to them, The reply I’ve gotten from them, “Oh it‘s going to be polish anyway“ And the list goes on. Not until I met Livinz Synthesis (through a referral from my colleague). We were initially wary as we had a bad experience with the previous ID from another ID ﬁrm. However both my IDs, Jackson and Chui Han ensures that everything goes well smoothly. They both will keep us updated about the weekly schedules and progress of the house renovation. Apart from that, they wouldn‘t make any empty promises. This is very crucial to us as the previous ID we engaged, he kept on assuring us that the design we want, it can be done. But when we saw the 3D drawing, it’s totally different from what we requested. There‘s nothing we need to keep track and worry about. Unlike Jackson and Chui Han, they managed to make my dream kitchen and Victorian bedroom come true. We would highly recommend both of them for all house owners looking for IDs to renovate your house. Great job to the both of them! I have engaged Livinz Synthesi for the renovation of my new home at Bendemeer BTO, and I only have good things to say about their team. We always found a way to meet to resolve technical issues and to move them forward. Livinz Synthesis team are professional and technical in getting the designs right, is good spirited and positive even when I’m split in some decision-making processes. He has a strong sense of responsibility in getting my house renovated fast and with a high degree of quality, and therefore regard / recommend him highly in areas of trust and responsibility. Livinz Synthesis was one of three interior designing companies I contacted in Jul 2016. Its quick response was a plus point as it gave me the reason to wanna find out more about its services. I was then introduced to Angelina, an interior designer. When we first met on site, I was really impressed by her ‘no joke’ character as she displayed her professionalism to listen (by hearing all my likes and dislikes) and to advice (by giving me new ideas, and good suggestions). And so on that day, I made up my mind that Livinz Synthesis was the one! The process (designing, planning, scheduling etc) started in an organised and a steady manner. To me, Angelina was not only my designer, she was also my consultant and a great helper 🙂 She was quick to respond, very patient, paying attention to every detail, and she was also pro-active to offer help at no extra costs! I must say the renovation was a bliss to me because of responsible and committed subject-matter experts (SMEs): the designer, the carpenter, the electricians, the painters, the air-con professionals and the general workers. All these SMEs were arranged by Livinz Synthesis. In conclusion, I am very pleased and satisfied with the end product. It turned out pretty well and close to what and how I want my new home to-be. The services provided by Livinz Synthesis were simply awesome! It is highly recommended if you are looking for a RELIABLE interior company. This is our second project with Livinz Synthesis and we have gone away impressed (once again) by their professionalism, commitment and attention to details when handling the renovation of our home. Despite an extremely challenging timeline, Isaac has exceeded our expectations without compromising the quality of work. He’s on the job all the time and keep home-owners like us abreast with updates and progress of work so that we have peace of mind. We’re personally impressed by the quality of his workmanship and his pleasant disposition. He’s affable and takes into consideration our personal preferences, but modifying our designs to make it aesthetically appealing. Even after job completion, Isaac does not shy away from managing the ‘loose ends’ of the project. He continues to follow-up with minor repair work which is a testament of his strong work ethics and pride at work. Had an awesome renovation experience with Livinz Synthesis team for the past few months. From conceptualization right up to completion, their team has been very prompt in all our queries and concerns. We could see how well coordinated the designers and his fellow contractors were throughout the renovation duration. Workmanship was wonderful too, which eliminated many headaches that would otherwise have come from a renovation process. We loved the designs and the selection of tiles etc that he had recommended and most importantly, as first time home owners, we had big ideas, of which some were impossible but the designers has been very open to our preferences and is always ready to explore through the concepts. He would also take efforts to explain in detail why some ideas were not possible and also came up with alternatives where applicable. All in all, engaging Livinz Sythesis has been our best decision in this entire renovation process. Big THANK YOU to your entire team!!!!! Livinz Synthesis took into account the big ideas we provided them and was able to conceptualize a living space that meets our requirements. Best of all my wife and I felt that Livinz Synthesis & their team provided the best value given a budget that we had them to work within. The contractors they engaged maintained a high quality of workmanship. We started off with an ID Firm back in August’17 and had an extremely unpleasant experience with them. We insisted on terminating the contract with them as dishonesty and integrity issues were involved. To kick start, quotation does not include the house theme you were asking for (The ID mentioned whichever ID firm we engage, it’s the same) and they had the cheek to ask for first payment when they didn’t even send us the 3D drawings. No protection were done to my existing parquet and I raised this issue to them. The reply I’ve gotten from them, “Oh it’s going to be polish anyway.” And the list goes on. Not until I met Livinz Synthesis (through a referral from my colleague). We were initially wary as we had a bad experience with the previous ID from another ID firm. However both my IDs, Jackson and Chui Han ensures that everything goes well smoothly. They both will keep us updated about the weekly schedules and progress of the house renovation. Apart from that, they wouldn’t make any empty promises. This is very crucial to us as the previous ID we engaged, he kept on assuring us that the design we want, it can be done. But when we saw the 3D drawing, it’s totally different from what we requested. There’s nothing we need to keep track and worry about. Unlike Jackson and Chui Han, they managed to make my dream kitchen and Victorian bedroom come true. All in all, it’s hard to find a very reliable and responsible ID out there as most of them just wish to close the deal, hand over the project back to house owners and find another project. But I’m thankful for both of my ID as they really spend their time to draft and list down the requests we were seeking for and advise us on the pros and cons of it. Both of them really place customer interests as their top priority. As we had a budget to keep to, Jackson and Chui han helped us to keep the renovation fee to as close as our budget. It has already been 2-3 months since we moved into the house and even though the house was handed over to us, whenever there is a problem, Jackson and Chui han is always prompt in replying us and sending workers up our house to touch up and fix it. Isaac took into account the big ideas we provided him and was able to conceptualize a living space that meets our requirements. Best of all my wife and I felt that he provided the best value given a budget that we had him to work within. The contractors he engaged maintained a high quality of workmanship. We would like to take this opportunity to express our upmost gratitude to our IDs, Jackson and Chui Han, for their great and hard work. We met around 15 IDs and finally decided to go with Livinz Synthesis as we felt that both of them are very sincere and committed. Although the quotation given were not the lowest, we still decided to engage their service as they managed to explain the breakdown of the charges and even proposed alternative solutions on how can we work out within our limited budget. There is no better word to express how grateful and amazed we are with their hard works, professionalism, and extra miles they have taken throughout the whole renovation process. As new home owners, we are unfamiliar with certain HDB designs and practices, interior designs as well as nature of cabinet/laminate materials but thankfully both of them are very patience and attentive to all our enquiries even into late night. Jackson’s experience is much commendable as he has played an important role in managing the contractors and troubleshoot site issues. Whilst Chui Han, always very helpful and gave a lot of advices on how we can embellish and match our fixture and fittings, allowing us to achieve the theme that we are looking for without deviating. Both of them gave us great confidence to an extend where we can simply let them decide on most of the design details. Undeniably, there were some hiccups in between but they get things solved in the fastest and easiest approach and we managed to move in on time as per scheduled. We didn’t regret to stretch our budget and will surely recommend both of them to my friends and family! Overall is excellent for my family. They love it from top to bottom and would strongly recommend Livinz Synthesis and even I have recommended my parents as they need to makeover their home. Carpenter, Plumber all very friendly and easy to communicate. Plumber really helps a lot to install other equipment. I would like to say excellent to Isaac and his team for the great workmanship. My new house has just completed renovation which has done by Livinz Synthesis. So far, we found that this company quoted a reasonable price compared with others. Throughout the reno works, he has updated the progress to me in details. He also charged us extremely reasonable prices for new thing to be added on. We were happy with the workmanship of the project his team of workers worked on. Besides, he would willingly redo any imperfections I pointed out. Of course sometimes there was a little bit delay. But overall all the problem area has been rectify accordingly.Thus, we are pleased with his service and attitude and we will sure recommend Livinz Synthesis to our friends & relatives. It has been a pleasure engaging Livinz Synthesis to renovate our home. As first time home owners, the renovation process was a new and anxious experience for us. The team from Livinz Synthesis was very patient and supportive in working with us to understand our requirements and budget. Their design ideas were also very creative. Most importantly, they were able to execute and complete the project in a timely manner, yet ensuring a high quality result. The customer service from Livinz Synthesis is also very good, and they respond to feedback and queries quickly. Isaac is a very responsible and attentive interior designer that has helped us a lot in our renovation projector. He follows through closely on the job and provide excellent service experience. Most importantly, we felt that he upholds honesty and has good work ethic. We would strongly recommend Isaac and Livinz Synthesis as your partner in designing and renovation. Isaac was our consultant when we renovated our home in June 2014. We did a major overhaul of our home, changing most of the fixtures. He possesses a very positive attitude and was patient with our requests and questions, providing good recommendations along the way. He provided us with a high level of service standard and was able to react promptly whenever we encountered any issues with the renovation works. We are overall very satisfied with how the results turned out to be, and are especially pleased with the new kitchen and bathrooms. We will not hesitate to engage Isaac again should we require future works, and will definitely recommend his services to our friends. Firstly, thank you for giving the opportunity to say our gratitude here. We are glad to select ‘LIVINZ SYNTHESIS’ to be our interior designer for our 4 room BTO at Punggol Way. Our reno works start end of Apr 014 and end early than expected. Isaac Lau was the 4th ID that we have met and other than Isaac, we have met up with 6 other IDS. As we don’t have much knowledge about renovation hence he gave us many Valuable and Practical information unlike others designers that we met. Isaac was not pushy and advised us with the pros and cons of what we needed for our renovation. We decided to engaged Isaac as our ID as he met 5 Good criteria, PRACTICAL KNOWLEDGEBLE, TRUSTWORTHY, RESPONSIBLE and ABLE to Communicated with Us. During the renovation phase, Isaac constantly update us on the reno works and will always check on site to ensured everything is in order, Isaac has made our renovation process an enjoyable one. We are also very contented with the renovation. We will definitely recommend ‘LIVINZ SYNTHESIS’ Isaac Lau as an ID to our family & friends. 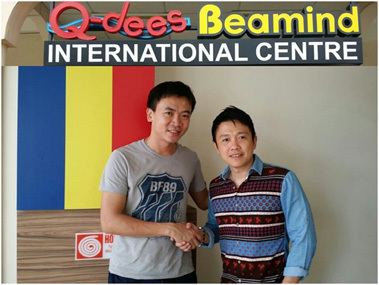 We wished a prosperous to the company and wish all the best to Isaac Lau. THANK YOU!! our services so we can keep delivering our very best to you!